ANTI-FLAG SET TO HIT AUSSIE SHORES THIS DECEMBER WITH SPECIAL GUEST, SCOTT REYNOLDS! US punk rock activists, Anti-Flag, are returning to Australia this December and will be bringing with them a world first! 2016 marks the 10th anniversary of their landmark For Blood And Empire album. Australian fans will be the first to witness the band honouring its release by playing the album in its entirety! Anti-Flag shows are a celebration of a collective that care about more than just their selves. A safe space where all can be free to be who they are. Free from racism, sexism, homo and transphobia, bigotry of any kind. Anti-Flag is the proud torchbearer for progressive collectivism, radical change, and free expression with heavy social responsibility. Injecting the underground and the mainstream with politically charged, deliberate, smart-but-no-less-visceral neo-punk. Standing against the corporate greed that hurts millions while benefiting the rich few, Anti-Flag fights against mindless nationalism. The band’s core beliefs have never been more important and on-point than in today’s delicate political climate. 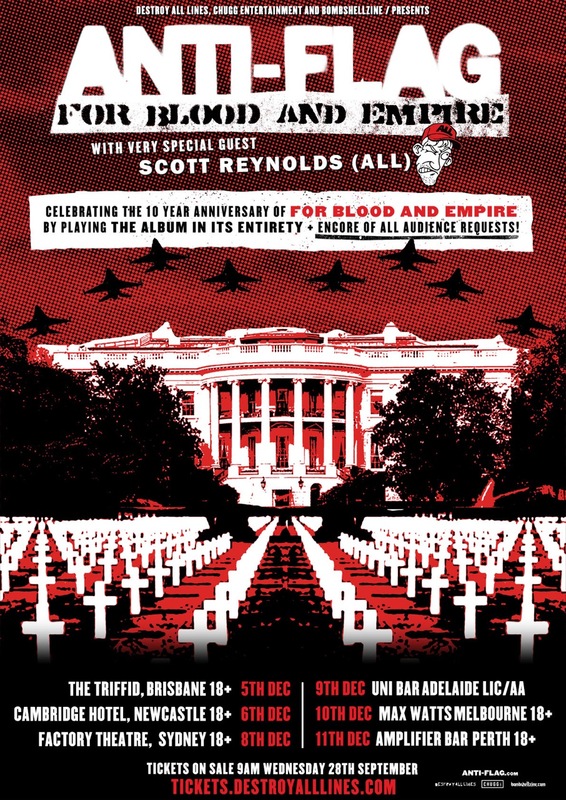 Anti-Flag will be joined by the legendary Scott Reynolds. Scott sang for the highly influential pop-punkers, ALL between 1989 and 1993. He has since gone on to spend the better part of 25 years touring the globe fronting bands such as The Pavers, Goodbye Harry, The Bonesaw Romance and Scott Reynolds & The Steaming Beast (featuring Steven Drozd of the Flaming Lips). Scott will be performing songs from all his incarnations including ALL! In conjunction with the Australian tour announcement Anti-Flag has released a music video for ‘To Hell With Boredom’ from 2015’s American Spring. The video features live footage shot during the band’s European summer tour. Watch the mayhem of Anti-Flag live here! On sale Wednesday, 28 September at 9.00am here. Find the official event page on Facebook.